Kent is available to do custom caricatures from your photos. They make great, one of a kind gifts. E-mail Kent for a custom quote. For Deluxe Gift Caricature Prices click "purchase info" at left. Kent is also available to draw live at your event...great for parties, trade shows, sales promotions, school events, banquets or any other special occasion. Fast and fun caricatures of your guests...only $80. per hour. 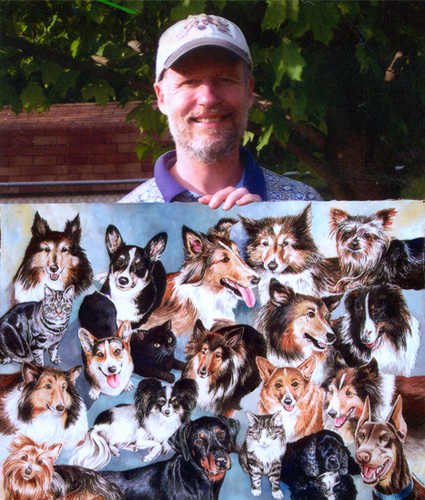 Kent offers pet portrait watercolors painted from your photos starting at just $350. Five standard sizes are available. Larger sized paintings can also be commissioned. E-mail Kent for price quotes on larger sizes. To purchase art, click onto "Purchase Info" at left. For more information and questions, click onto "Contact" at left.